Dallas Fed Manufacturing Survey, March 2019: Solid, though below consensus [Econoday]. “Despite the strength in production and employment, today’s report is mixed as trouble for new orders points to trouble ahead for general activity and is line with a large body of data pointing to a slow start for this year’s factory sector.” And: “This survey remains in positive territory with subindices new orders again declining and unfilled orders marginally declining with both in expansion. Even though there was a marginal improvement in the general index, this report should be considered somewhat worse than last month because of the decline of the key subindices” [Econintersect]. Manufacturing: “Boeing to Meet Regulators, Pilots to Detail 737 Max Fixes” [Bloomberg]. “The planemaker invited more than 200 pilots, technical leaders and regulators for an informational session Wednesday in Renton, Washington, where the model is built, Boeing said in an emailed statement Monday. The company said it met Saturday with some U.S. and overseas customers…. U.S. air-safety regulators are leaning toward approving Boeing’s changes to software and pilot training for the Max.” • Um, are the changes still self-certified? Rapture Index: Closes up two on floods. “The Central U.S. has been hit with massive floods” [Rapture Ready]. Record High, October 10, 2016: 189. Current: 179. Heading back to 180. Remember that bringing on the rapture is a good thing. “First policy report – 50 shades of green: the rise of natural capital markets and sustainable finance” (PDF) [Green Finance Observatory]. “Carbon markets have spectaculary failed to curb greenhouse gas emissions for over a decade, and it has been demonstrated that they suffer from unresolvable conceptual issues, such as the inexistence of a reliable price signal. As a result, they will never work and should be abandoned. Once carbon becomes an asset class for investors, it is also likely to create significant financial stability risks, with a high risk of contagion to other asset classes and the wider economy.” • Well, that throws down the gauntlet! “The Fight to Tame a Swelling River With Dams That May Be Outmatched by Climate Change” [New York Times]. “For millenniums, the Missouri was a wide, sinuous river. Passage was treacherous and steamboats frequently sank in the shallows. The river flooded in the spring, and you could walk across it in the fall. After the devastating dust bowl years of the 1930s and a series of severe floods in the early 1940s, Congress decided to do something. It was the era of big dams. Across America, landscapes were being rearranged to suit human needs. Over time, the broad, shallow river was transformed into a deep, narrower channel more conducive to the river shipping business, in the process creating new land along the banks…. A 2012 report on climate change in the Missouri River Basin, commissioned by the Bureau of Reclamation (the Corps’ western equivalent) predicted by the middle of this century a roughly 6 percent average annual increase in upper-basin runoff and a bit more than a 10 percent increase in the lower river.” • Intereresting article on managing a system of dams. “Glacier melt on Everest exposes the bodies of dead climbers” [CNN]. “More than 200 mountaineers have died on the peak since 1922, when the first climbers’ deaths on Everest were recorded. The majority of bodies are believed to have remained buried under glaciers or snow. ‘Due to the impact of climate change and global warming, snow and glaciers are fast melting and dead bodies are increasingly being exposed and discovered by climbers,’ Ang Tshering Sherpa, former president of Nepal Mountaineering Association, told CNN.” • If there’s a Goddess in that mountain, she’s not happy about any of this. “Is Michigan’s UP Winter Culture Melting?” [Belt Magazine]. “Like the rest of the world, the UP’s climate is heating up. Between 1973 and 2010, ice coverage in the Great Lakes declined by seventy-one percent. Heavy rain events in the Midwest now shed thirty-one percent more rain than they did fifty years ago. The rains not only replace the possibility of potential fresh snow; they also wash away the already-established packed snow and ice. In the short term, the lack of Great Lakes ice coverage can actually cause higher levels of lake-effect snow, which can negatively affect sports like sled dog racing. For this year’s UP200, officials moved the end of the race because heavy snow caused safety concerns. But in the long term, by 2060, unless climate change is slowed, some scientists predict Michigan’s winter precipitation will be mostly rain. These changes will drastically affect local traditions like the UP200, unless mushers and locals are able to adapt.” • Perhaps the dogs can drag boats instead of sleds? “Mother Nature & U.S. Grant” [The American Conservative]. “I have come to think about global warming as being analogous to slavery in the US. The South knew that its entire economic and political order depended on slavery. It was impossible for them to think about ending slavery, because to have done what it took to end slavery would have meant the end of an entire way of life.” • Hmm. “Guggenheim Museum Says It Won’t Accept Gifts From Sackler Family” [New York Times]. “The Solomon R. Guggenheim Museum in New York said on Friday that it did not plan to accept future gifts from the family of Mortimer D. Sackler, a philanthropist and former board member whose money has been met with growing unease in the art world as his family’s pharmaceutical interests have been linked to the opioid crisis…. In the statement, the museum said members of the family had donated $9 million to the Guggenheim between 1995 and 2015, including $7 million to establish and support the Sackler Center for Arts Education. The spokeswoman said the center’s name was contractual and the museum had no plans to change it.” • “Unease.” Somehow, I don’t get the sense that the Guggenheim is trying all that hard on the contractual issue. Maybe they could put up a plaque saying that although they’d l-o-o-o-o-v-e to change the name — explaining why, perhaps using stronger terms than “unease” — they just can’t? And how about you, Harvard? “Mystery parent paid $6.5 million to get kids into top universities as part of admissions scandal” [Los Angeles Times]. “Someone paid $6.5 million to get his or her children into elite schools. But the identity of that parent — and details about which schools were involved — remains a mystery nearly two weeks after authorities in Boston filed the charges against dozens of wealthy individuals. The lack of information about the money is more notable given that the charges go into intense detail about the alleged actions of other parents, who are accused of bribing and cheating to get their kids into schools such as Yale, USC and UCLA. Prosecutors have mentioned the $6.5 million in payments at a news conference and in court. But they are not included in the hundreds of pages detailing the charges.” • Why not just give the kid the money? “Minnesota Amazon Workers Walk Off the Job over Speed-Up” [Labor Notes]. “After yet another speed-up in a workplace notorious for its lightning pace of work, workers at a Minnesota Amazon warehouse walked off the night shift for three hours. The March 7 walkout at Amazon’s fulfillment center in Shakopee, Minnesota, was these workers’ second job action in three months…. Supervisors refused to meet with the workers as a group, but agreed to meet with a representative the next day. According to the strike’s organizers, nothing concrete came out of that meeting.” • Of course not. 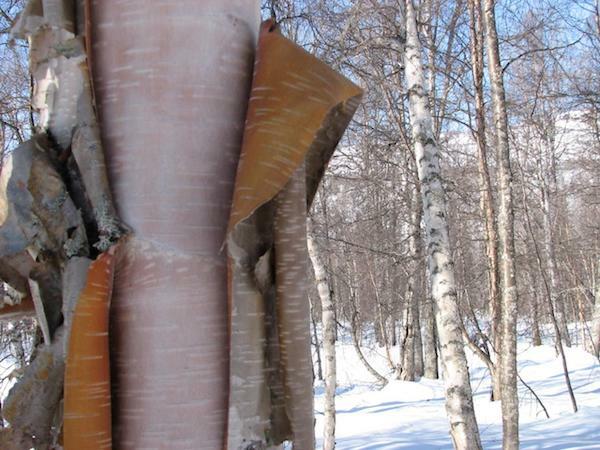 mgl writes: “Birch in winter near Curry, AK.” Birch bark is lovely to light a wood stove with; far superior to newspaper! Steny Hoyer has a Democratic primary challenger, Mckayla Wilkes. She is an IT worker who supports Medicare for All and the Green New Deal. Anyone from Maryland’s 5th CD? Anyone know anything about her? I’m ready to donate sight unseen; it would appear that Omar also needs another $27.00. After the kerfuffle over AOC taking out Crowley, one can only imagine the reaction to a progressive taking out Hoyer. That, alone, would be worth the admission fee. This is a kind of paradoxical expression. First, inflation figures are bogus as anyone who actually goes shopping for essential goods knows. Second, the Fed viscerally hates inflation because its job is to make sure the banks can keep making money on their artificially high rates. We need a new kind of national bank that is independent of the banking industry first and second we need a debt jubilee particularly for student loans. We need a popular understanding of MMT. Is The Fed (this specific Federal Reserve as it exists) still included as an agent of monetary policy in MMT? Don’t know what MMTheorists say, but constitutionally, Congress and Treasury are responsible for money, so the Fed would be essentially an intermediary. I would recommend (to anyone that has the time) reading the paper co-authored by Kelton on the macroeconomics of student loan cancelation. My italics, or course. Doesn’t imply that at all, does it? Do they know even what “median” means, let alone the fact that “past results is not to be considered an indicator of future returns?”. The Special Water Cooler link is not working. “Mystery parent paid $6.5 million to get kids into top universities as part of admissions scandal” [Los Angeles Times]. Dough4Dopes didn’t make the progeny any smarter once they got into a top university, how’d they fake it from then on? I attended the Wharton School at the University of Pennsylvania as an undergraduate in the late ’60’s-early 70’s. One of the greatest unacknowledged realities of elite schools is that the difficulty of the course work is not much greater than that of far less elite schools, with rare exceptions of course. Course difficulty depends far more on the professor and his/her expectations and assignments than the school at which they teach. Unless they want to be known for a high failure rate, which would make their classes much less attractive, they have to teach to the lower end of the range of intellectual comprehension of the students. Edit: Caught by Akismet. Curious. I haven’t had a comment in moderation for quite awhile. Must be my turn. Correct me if I’m wrong, but I have read about lawsuits over this type of issue. In essence, they revolve around a young person who is in his/her teens, there’s a trust fund or some other pot of money in the offing, and the young ‘un wants it. IIRC, the decisions have essentially said that, once the young ‘un hits age 18 and isn’t mentally incompetent, he/she is entitled to make a claim on the money. Again, correct me if I’m wrong. Depends on the trust terms and the state laws regulating the trust. Key word in Trust Fund = trust. Some have higher ages before they are open for grabs. If this young adult has one, depends on how much he/she is trusted. 3) If you can afford to burn $6.5m on getting the kid admitted, he’ll probably have a lot more coming in his inheritance, so what’s the rush? 3) it was a way to give the little [family blog] less than he’d otherwise be getting. So I admire the newsrooms for showing pictures of an industrial hellscape and still managing to pronounce the name “Deer Park” without even a flicker of incredulity. “Supervisors refused to meet with the workers as a group, but agreed to meet with a representative the next day. According to the strike’s organizers, nothing concrete came out of that meeting.” • Of course not. The management organized collectively for the meeting but not the workers. The elites have all kinds of collectivism going, don’t they? But they insist its better for YOU to bargain on your own or with one representative or leader that they can target. “The elites have all kinds of collectivism going, don’t they? They even have ‘gang colors.’ Harvard crimson, Princeton orange and black, Yale blue. If they are to get rid of pests and they are all over what you eat…. . . . . maybe you are the pest. I still don’t like kale .. pesticides or no ! Even the hens won’t eat it ..
What kind of kale have you been feeding the hens? What variety? There are some kales I have not liked, and a few I do like. I like Lacinato, generally. Especially young mid-sized not-fully-toughened-up leaves. Reads pesticide load list, heaves big sigh of relief. We grow our own kale, strawberries, apples, grapes, cherries, pears, tomatoes, (some) potatoes. On a 50-foot lot in a small town. We some years ago stopped eating nectarines and peaches suspecting pesticide overuse in the Okanagan Valley. We also glean apples, plums, pears, figs from neighbours who don’t pick their fruit, adding to our own supply and helping supply two local food banks. We grow a few other fruits and veggies in our little yard as well. Feeds us and others. There is also an excellent farmers market nearby. Re: Boeing, Lambert asks: Um, are the changes still self-certified? Lambert, would it really be possible to build a functioning FAA in two weeks, even if TPTB WANTED to? Interestingly, AOC has not yet signed — but Tulsi is among the original co-sponsors — good for her! It’s not only about “corporations” being considered people. You’ll have lobbyists against this because they fantasize about giving human rights to robots and assorted, alleged AI. Some fully plan, in this fantasy, for mechanized “workers” to have more rights than unemployed humans. So that’s where this really gets interesting. We citizens should get to use all the same tax breaks as corporations use starting from the minimum standard deduction. No, the idea of corporate personhood had its day. Really, it can be put in the grave and life would go on just fine. I say we hang the Corps es ! That’s the approach we need. > Lambert, would it really be possible to build a functioning FAA in two weeks, even if TPTB WANTED to? But, the “F” word, (must, never, be, spoken), has reared it’s Horrifying Visage. A fake ruling class (politicians, scientists, lawyers, economists, sociologists, analysts…) being promoted by a tarnished MSM. How many PhD Degrees are ersatz? Not something I’d want to think about on the operating table…. There are real limits to our capacity to capture all impacts within markets, and the idea that a tax or a cap and trade program could actually capture the full impact of the non-market cost or benefit that they are trying to take into account is unrealistic. I think people need to let go of the notion that markets can be reformed to do things they aren’t able to do. It does create a very complicated situation, but it is what it is. In the socialist calculation debate, one thing the Austrians did point out is the limits to planning. I think planning is needed to deal with the environmental crisis, but there are limits to what you can plan. Some decisions will be, and should be, decided on at the enterprise or individual level. What the Austrians cannot accept is that while there are limits to planning, there are even larger limits on dealing with macro-environmental issues at the individual level. If a planning body is limited in how much information is needed to make good decisions on these matters, how is an individual or a business not even more limited in that regard? The impacts we are now dealing with are non-market impacts, and those impacts often touch people across the globe, people not yet born, ecosystems, etc.. When you go to the store and buy a product, even if you are someone that cares about the environment, do you really know the full environmental impact of the stuff you are buying? Trained ecologists, biologists, atmospheric scientists and the like that study this stuff all day struggle to capture the full impact, and yet regular people with little to no backgrounds in those issues are expected to know that stuff? What would be expected of you if the idea was that you as a consumer and you as an individual business owner had to take the full environmental impact of your activity into account? Could we expect most business owners to do this if it was clearly in their interest and would be profitable to externalize their costs? Could a chaotic, decentralized economic system, with people and institutions that have complex and often opposing interests, be expected to operate within sustainable limits without some coordination and planning? And, if we could price the full impact of carbon, given that carbon is embodied in everything, how much would everything go up in price? Then what? Again, markets are a really messy way of dealing with this, a means that has no realistic chance of working. Carbon taxes could help a little, they are probably better than nothing, but we should be real about actual solutions versus what we want to be a solution simply because it is easier, or requires less structural changes. Grant, once I copy-pasted your post and broke it into intelligible paragraphs, I agree that there are limits to planning. Ostrom is interesting, it was her work and Herman Daly’s work that got me interested in ecological economics. Derek Wall has a book that Pluto put out recently as well on Ostrom. Ostrom for Radicals I think it was. In her most well known book (Governing the Commons) she showed instances where common pool resources were managed well across the world, some going back centuries, and other instances where they weren’t. In that book, her argument was that institutional diversity was needed, that private, communal or public management and ownership could all work better or worse than others in particular contexts. She was in part responding to some of Mancur Olson’s ideas on collective action problems, but also Garrett Hardin and some of the ideas that people associated with his tragedy of the commons article (Hardin himself said that he would have named it tragedy of the unmanaged commons if he could go back in time, since he said that communal ownership wasn’t an issue by itself, it was communal ownership along with the absence of enforcable rules for the use of the common pool resource that was the problem). She also had interesting ideas on the knowledge commons and forest management that I like. Thanks for the heads up, and sorry for the sloppy writing above. I would point out though that there aren’t many calling for full socialization these days, and few are calling for comprehensive planning of the USSR variety. What is most in need of discussion is the limits to markets. We can’t deal with, or at least mitigate, the environmental crisis without some form of planning, and we should think a bit more critically about the limits to markets. I get the feeling from people that they think that we can just price complex environmental impacts and then everything is solved. It is dangerously naïve. We have to be honest about the limits to markets, and figure out how to have an economic system in a complex society that doesn’t reduce everything to market values. That is certainly a hard thing to do, but needed if we want to get serious about the environmental crisis. I don’t find that the Austrians and most neoliberals have much to say on the limits to markets. Seems that the entire Austrian means of dealing with environmental issues and non-market impacts is to privatize everything and to battle it out in court. The neoliberals say, let’s tax carbon, problem solved. This is a systems issue, no need to assume that things stay as they are at the root. At least part of the problem in recognizing and identifying the limits to markets is getting the public at large to understand that markets are man-made creations of policy rather than immutable features of nature/reality. And the additional challenge there is that those for whom the current market operations are profitable are highly incentivized to obscure this truth — and they are well funded and ruthless. Expect resistance, and expect them to play dirty. “Glacier melt on Everest exposes the bodies of dead climbers” [CNN]. Not my cup of tea climbing big mountains such as Everest, i’m content with 4/10’s scale models here in the High Sierra, where one never sees all the squalor of empty oxygen bottles, trash & debris (let alone a few hundred freeze-dried died climbers) that accompany many photos I see of Everest base camp and along the way to the top. No thanks. That’d be freaky, walking past a high altitude outdoor morgue. Apparently some bodies are used as land marks so that you can tell where you are. They have been there for so long. Not sure about the mentality of people that think that this is ok.
Yeah, but poor people allegedly “can’t afford organic” say the chempologists. So they buy lots of conventional non-organic produce grown in crappy nutrient starved soil, blasted with ammonia fertilizer, meaning less nutrient density, less flavor and less satisfaction than organic, so they eat even more of it and definitely get the extra calories, plus the GMOs that trigger allergies, the Roundup, pesticides and they top it off with a dollop of Dacthal. That all helps raise GDP, to and including the chemotherapy. Bottom line, organic is cheaper, helps you lose weight, tastes better and is far healthier. That’s why it’s the only segment of the food industry that is growing, and spectacularly. People in larger numbers are wising up. Thanks for that Ecowatch link. The problem is that the Certified Organic is more expensive at initial point of purchase. A lifetime spent eating the Certified Organic version of your favorite foods will likely save you more money downstream through sickness expenses not incurred than the higher price of the Certified Organic food in the meantime will add up to. But a lot of poor people may not have the money up front RIGHT NOW . . . to be able to pay the higher point-of-purchase price RIGHT NOW . . . for the Certified Organic version. So they are in no position to act on the long-range wisdom. The answer is to raise wages of the working poor up to a Certified Organic level . . . and give the unemployed poor enough money to buy Certified Organic food. Or maybe just buy the food itself through government programs and give them the food. ( An aside . . . Certified Organic is not in itself a guarantee of high nutravitamineral density in the food. I have bought certified organic cherry tomatoes which exploded into fuzzy mold fungus rot with a circling fog of fruit flies 3 days after getting them home. And I have bought conventional cherry tomatoes which were so metabolically healthy, meaning so nutravitamineral-rich that they stayed un-rotting at room temperature for several months before then slowly drying down like raisins. What Certified Organic IS a guarantee of . . . is being grown without a whole range of long-range cumulatively toxic chemicals. It is a matter of what you are paying to avoid). Hey stop picking on Christian Bale. He’s a good actor. Actually that article’s pretty funny. Bale is one of the greatest actors of all time, but theres no way he could gain all that weight. I nominate Nicolas Cage doing Mo-Cap. Im even more excited for the movie now. Does that whale of a Bale worm come in black .. or just kaki sand ?? That Missouri River has always been a force of nature. I was reading Mark Twain’s autobiography and he was talking about how the river changed it’s course from time to time. Once a Captain pointed out that their river boat was going through what was once a town. The river had changed course and was obliterating the town itself and there was just the out areas still intact. Amazing that. You know, I like Tim Duy a lot and look forward to his posts on the Fed. But really, “the natural rate of unemployment” is an extremely big bunch of baloney. NAIRU dropped through the floor during the Clinton years and all the genius-boy economists could do was scratch their heads and wonder where the inflation was. Well maybe the Phillips Curve went all flat because the workers had lost all of their bargaining power and inflation was quiescent. Heaven forbid we discuss structural issues in the economy. Moreover, what about all of those Nobel Prizes for yet another bunch or Chicago School, reactionary nonsense. As I recall, Phelps got his Nobel for this theoretical crappola after the discussion of, “gee, where is the inflation” died down. London (CNN) – British lawmakers have temporarily seized control of the Brexit process from Prime Minister Theresa May, in a rare move that puts lawmakers in the driving seat. MPs voted in defiance of the government on Monday for an amendment, carried by 329 to 302, giving them control of Parliament’s agenda on Wednesday and clearing the way for a series of alternative votes to May’s widely criticized withdrawal agreement with the European Union. Oh, they’ve been trying to do this for a while. We mentioned this likely happening in our last two posts. The PM is much more powerful than the President in the US system because the PM controls Parliament’s time. Sets when bills and motions are to be considered, how long debate is, when the vote starts. The PM can also keep things from being considered at all. Parliament has taken control of the scheduling on Brexit. After the devastating dust bowl years of the 1930s and a series of severe floods in the early 1940s, Congress decided to do something. I thought it was the Mississippi River flood 1927. That flood was merely the largest. There was pressure to do something before and there has been work on it nonstop since. It is something of a pork barrel to get the Corps of Engineers to go wherever the Congressional horse trading got it to go. Of course where was done wasn’t we’re it was needed the most only were whatever interests won in Congress. It is one of the reasons Hurricane Katrina was so damaging to New Orleans as the necessary work was not done in time because of the horse trading. It is like the Mississippi Delta disappearing because the petrochemical and shipping industries have enough clout to overcome the fishing and tourism industries as well as the cities, towns and smaller communities either need the delta’s protection from hurricanes or the land that they are on is disappearing. It is frightening to me to find I am agreeing more and more with articles in the American Conservative. Never thought I would see the day. The article in Water Cooler today, ““Mother Nature & U.S. Grant” [The American Conservative]” sadly appears to be a realistic take on what is and what is to come. Perhaps I have finally come to acceptance. Why? They are the remnants of what much of American conservatism used to be; the writers are exiles from the Republican Party and in cases fired or socially ostracized. The entire political spectrum has been squeezed to the right. Both parties used to be much broader parties and what is considered the Democratic “left” is actually what used to be center right and generally Republican. The Trump administration on Monday said it supports a federal judge’s ruling that the entire Affordable Care Act should be scrapped, signaling a shift in the Justice Department’s position. “The Department of Justice has determined that the district court’s judgment should be affirmed,” three Justice Department lawyers wrote to the 5th Circuit Court of Appeals, which is now considering the case. The Trump administration had previously argued that only elements of the ACA, like its protections for patients with pre-existing conditions, should be struck down but that other parts of the law could stand. This is typical of the dubious “all else being equal” approach that undermines most analysis of nuclear energy risk. If humanity was really going to loose in its entirety the knowledge about the dangers of radioactive materials, it would also loose a lot of knowledge in many fields, especially medical fields. For instance “forgetting” about antibiotics alone would cause many more early deaths by bugs than radioactive material deaths by cancer. I don’t blame the University professor who wrote the report : semiotic is his job and any government contract is good for an academic at the beginning of the 80’s (I.e. before the higher education bubble). I would however definitely shame the people of Battelle who came to the stupid idea that such a study would be relevant and useful.